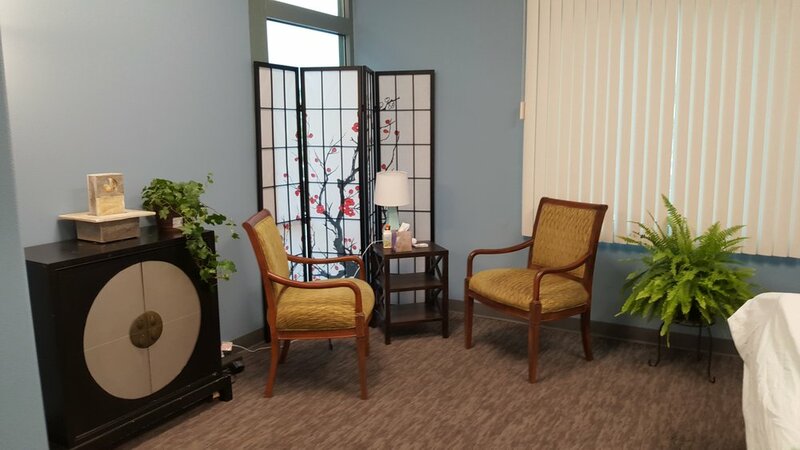 Spring Mountains Acupuncture is pleased to offer therapeutic fertility massage and NMT massage (neuromuscular therapy massage) to patients. Erin Brassington ANMT, CHE, and Certified Nurturing the Mother Fertility Massage Therapist is a highly trained and certified therapeutic fertility and neuromuscular massage therapist. Therapeutic massage compliments acupuncture for fertility and any number of pain conditions. While relaxation is part of the benefit, therapeutic massage goes further in helping the body restore balance, reduce pain, move fluid, increase blood flow, and reprogram mind/body disconnects. Fertility massage is a blend of acupressure, reflexology, and total body alignment techniques that focus on the reproductive system. It is a very slow, gentle, and empowering massage to ensure the mother is fully in tune with her body and able to welcome a child into her womb. Massage reduces stress hormones, which negatively affect reproductive hormones. (For more information on the effect of stress on fertility, see the natural fertility page). This unique and highly effective massage protocol includes fertility awareness, cleansing therapies and visualizations in addition to abdominal massage, reflexology and castor oil packs. Abdominal massage helps break up pelvic adhesions, which can decrease optimal blood flow; cleanses the digestive system, which removes toxins; restores optimal uterus position, which helps sperm and egg alignment; and increases circulation through the pelvis, which results in better delivery of nutrients to the developing follicles and may improve uterine lining thickness. Reflexology is a foot massage that stimulates various organ zones on the feet. It can stimulate the nervous and endocrine systems, boost reproductive organ function, and help flush out and eliminate toxins in the body. The pressure level is always adjusted so it is comfortable for you, and it is non-invasive and induces deep relaxation. Castor oil packs can also increase fertility. They help to detoxify your reproductive organs and tonify your blood cells. Castor oil packs are frequently applied to the liver to help it decongest, which may promote healthy hormone balance. The visualizations used in fertility massage taps into the power of your mind-body link. Fertility issues cause stress, and visualizations allow you to relax, release muscle tension, and promote healing. I am a trained and fully certified Neuromuscular Massage Therapist. Neuromuscular Therapy is ideal for any issues related to pain, injuries, accidents, day to day stress, sports, and/or optimizing physical performance. There are only a handful of things Erin can’t fix. By retraining and reprogramming your brain to function in cooperation with your body, neuromuscular therapy can eliminate the majority of issues you experience on a day to day basis. A critical factor is educating you. To ensure continued progress in healing, in each session, Erin teaches you what you will need to confidently create and maintain relief. So what conditions benefit from Neuromuscular therapy? Erin can significantly reduce the severity and frequency of migraines, if not eliminate them. She will find the root cause of your low back pain and reset it. Pain and injury usually finds the weakest link. If you have old injuries that flare up, Neuromuscular Therapy will treat the root cause and help you feel as good as new. This is not an exhaustive list. If your condition isn’t listed, give me a call and we can discuss whether Neuromuscular Therapy is right for you. Erin Brassington is a certified Advanced Neuromuscular Therapist and certified Nurturing the Mother Fertility Massage Therapist. She has been practicing for over 5 years in California, Washington, and Nevada. Her fertility massage training was done with the renowned Claire Miller, a pioneer of the fertility massage field over the past 20 years. Erin’s entrance into the fertility field started from her own personal journey through infertility, stage 4 endometriosis, and PCOS. Her goal is to provide every woman comfort, support, and success in all stages of life. Erin has two wonderful dogs, and she enjoys spending as much time loving on them as she can, as well as cooking, singing, and entertaining friends and family at her home with her partner, David.